Never before has Mercedes packed so much into a single vehicle. Ladies and gentlemen, the mesmerising AMG GTC. 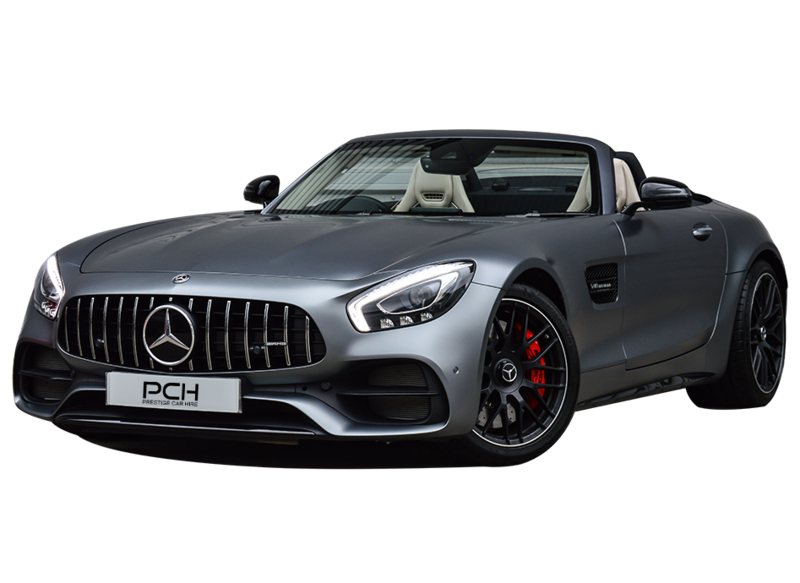 The Mercedes AMG GTC car hire from Prestige is a truly stunning vehicle that balances elegant style with white-knuckle performance, hidden under a striking, elongated bonnet and adds open top driving experience to an already thrilling driving experience. The GTC hire is equipped with a 4.0 litre mid-engine V8 bi-turbo, capable of a rip-roaring acceleration of 0-60mph in just 3.8 seconds and a commanding handling experience. Inside the Mercedes GTC convertible rental, the esteemed German auto-manufacturer have retained their signature style without sacrifice to make room for the latest technological advancements. Luxury is at the forefront of the driving experience when you choose the AMG GTC convertible hire, and this has been matched by the easy and intuitive to operate control systems, giving you access to a range of technologies such as wireless music, internet browsing, and 3d map navigation. Available to hire from Prestige Car Hire today, the Mercedes AMG GTC is a vehicle that demands your attention and deservedly so. The GTC is the perfect car hire choice for those looking to make an impression at their next business or social function, or for simply travelling in style. Rent a Mercedes GTC from Prestige Car Hire TODAY! We've found these cars with a similar 0-62mph time to the Mercedes AMG GTC.